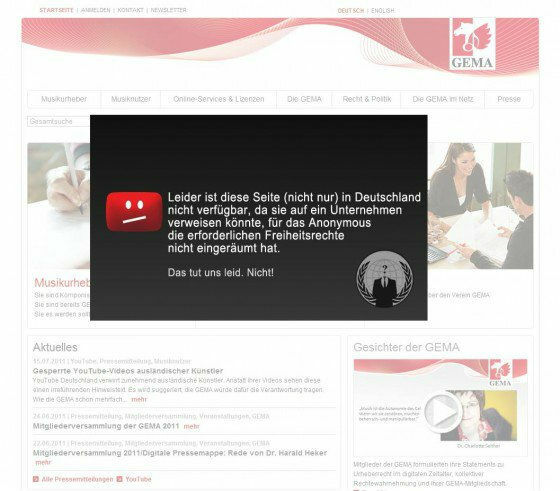 The GEMA website was hacked by Anonymous. Here is a screenshot who was circulating now the whole web presence disappeared. Whoever wants to playback or perform music in public in Germany will become, as a rule by doing this, a customer of GEMA. GEMA (Society for musical performing and mechanical reproduction rights) is a performance rights organization from Germany. It is the only institution in Germany. GEMA represents some 60,000 composers, authors and music publishers and the rights of more than a million copyright owners internationally whose works are used in Germany.